An extremely versatile piece as it can be transformed into many different half face masks, and then all the different shapes and colours that my imagination comes up with. 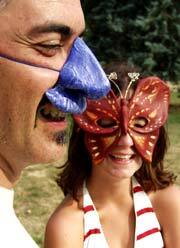 A peculiar but very expressive theatrical style mask with another big nose. Half face mask. Exactly that... a face ...with no nose! Half or full face mask. Born from a childhood memory of a Dodo in Edinburgh’s Chamber Street Museum. Half face mask. A strikingly big nose in a small face, a great character mask. Half face mask. Born from the need in the world to play – here is the perfect pocket size mask.